Properties in Dinan average 4.7 out of 5 stars. Property 5: Cosy country cottage for two on permaculture smallholding in French countryside. Ty 'Malo, "La Cabane" Golden Triangle St Malo-Dinan-Dinard, near Mt St Michel. 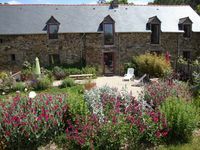 Property 25: Ty 'Malo, "La Cabane" Golden Triangle St Malo-Dinan-Dinard, near Mt St Michel. Autumn stay. Charming, cozy eco-cottage. Bord de Rance. Property 30: Autumn stay. Charming, cozy eco-cottage. Bord de Rance. Our host was friendly and helpful with lots of good information and suggestions. The 2 bedroom unit clean and quiet with more than enough space for our family of four. The kitchen is well stocked with everything to cook your own meals, market not far away. Having use of the lovely yard and access to the farm fresh eggs was a nice bonus. We definitely would stay here again. Thank you for sharing with us. Large French farmhouse in a secluded quiet location.Near to local beaches. Lovely huge main bedroom with shared large shower room and a second double room with single beds both on top floor. Then a good size double bedroom and en suite.on the middle floor . Large comfy sitting room too on middle floor Kitchen .and big kitchen table downstairs. 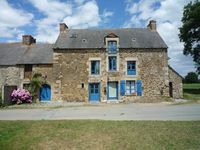 The property is quiet very rural but close to good local beaches eg Lancieux and Dinard a bigger busy resort , lots of restaurants and an excellent Super U at Plancoet a local town .Dinan and all its attractions with easy parking Is a mere10 mns away.. If you prefer there is an excellent barbeque and large outside table and chairs to use in the warm evenings for a meal or a family game of something.. A great time was had by all.